"Little Richard, King of Rock and Roll"
With "A-wop-bop-a-loo-mop-a-lop-bam-boom!" Rock and Roll was born and Little Richard Penniman blew the lid off the Fifties. Tutti Frutti was voted the #1 record that changed the world, and the Library of Congress claims it "heralded a new era in music." Little Richard was an innovative and charismatic performer, appearing in sequined capes under flicker lights, running off and on the stage jumping, yelling, and sliding across the top of his piano. He inspired many of the greatest recording artists of the 20th century, including the ones I painted as the jewels in his crown, clockwise from top left, Jimi Hendrix, Paul McCartney, Skip Spence, Mick Jagger, John Lennon, Bob Dylan, and myself. Hendrix played in Little Richard's band and said "I want to do with my guitar what Little Richard does with his voice". He taught McCartney his distinctive vocal "whooooo", and John Lennon said "When I heard [Little Richard's Long Tall Sally], it was so great I couldn't speak... I didn't want to leave Elvis, but this was much better." I was friends with Little Richard in 1971 and 72, desperately looking for a creative outlet. One evening I drew a sketch of him, my first, showed it to Little Richard the next day, he asked if he could have it, and I happily obliged. A couple years later I became a painter, and have gone on to paint around 2000 oil paintings. Little Richard's seventeen original hits from 1955-57 included Rip It Up, Long Tall Sally, Good Golly Miss Molly, Jenny Jenny, Keep A-Knocking, and Lucille among others. At Little Richard concerts Penniman also brought the races together in segregated America. They would start in the seperate "white" and "colored" sections, but by the end of the night they were usually mixed together, earning Little Richard the enmity of racists such as the North Alabama White Citizens Council. With all the praise of Little Richard, from people like James Brown, Buddy Holly, and Michael Jackson, nobody said it better than Screaming Lord Sutch: "Little Richard, The King of Rock N Roll NOW and for all time!" 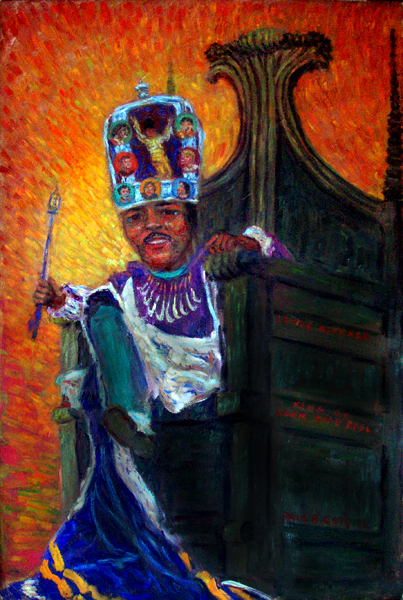 PaulB's Pointillistic/Impressionist original oil paintings of Little Richard, Rock & Roll and various prints and poster formats of a wide variety of subject matter by the Pointillistic/Impressionist oil painter from landscape/waterscape paintings, dance, sports, portrait, to classical figures, flowers, Brazil, Little Richard, and other Rock & Roll paintings and prints are available for purchase for as little as $24.95 for an 8" x 10" matted print on photo pape. Pointillistic/Impressionist Giclee prints of Rock & Roll on real canvas or heavy watercolor paper are available. One of a kind Rock & Roll embellished prints, which are Giclee prints retouched in genuine oil paint by PaulB. Unless noted PaulB's original Pointillistic/Impressionist oil paintiings are oil on canvas. Paul Berenson's pointillistic/Impressionist oil paintings are in privale collections around the world, including the downtown Los Angeles Athletic Club and have appeared in numerous publications, including the New York Philharmonic Playbill. PaulB.com also builds websites and PaulB is a member of the LA Web Professionals Group.